Summer is finally here and that means one thing in my mind, amazing new fashion trends! I am constantly looking on Pinterest and Instagram at all the brand new looks and I am just IN LOVE. The warmer weather means brighter colors, fun patterns, and lots and lots of maxi dresses (my personal favorite). 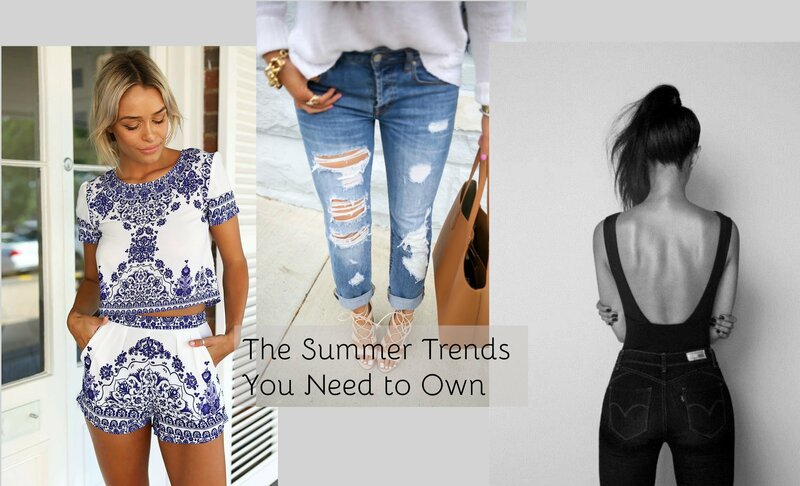 Here are the looks that I am completely obsessed with for Summer 2015. Two-piece outfits: We all know what crop tops are, but there is a new trend sweeping the town. I am in love with two piece outfits and it isn’t hard to see why. From high waisted shorts/pants or a sleek skirt with matching tops, they are ah-mazing. Body suits: I own a body suit and absolutely love it. There are so many different varieties that you can pair with jeans, a skirt, or shorts. Once you buy one, you will just keep buying more. I personally love to pair my body suit with a pair of high waisted jeans! Destroyed boyfriend jeans: Though this style has been around for quite some time, I feel like it is recently making a come back. I love tucking my boyfriend jeans up in a cuff at ankle length and wearing a fun heel with it! Pair it with a fun top and you look like you belong is NYC drinking a Starbucks while hailing a cab (very city chic). I have always been a dedicated online shopper but I only just recently started shopping through boutiques instead of popular clothing sites. Though I love Express, Forever 21 and sites like those, I have found that online boutiques carry pieces that are more my style! While they may be a little more pricey, I love walking around knowing that I won’t show up to an event in the same Express sweater as another girl. From all of the boutiques I have looked through, there are a few that are my go-to sites. Take a look at my favorite sites and you will fall in love just like I did. Happy shopping fashionistas, xoxo. The Rage. This is the first boutique I started shopping at and I just love their southern flare. They are located in Arkansas and have the best summer pieces. They love to use bright colors and patterns that are perfect for any summer day/night. Also check out their accessories, they have the best necklaces and heels to accessorize with! Danity Hooligan. This site is a little more on the pricy side but I absolutely love everything they have to offer. Dainty Hooligan carries styles that are a little more trendy and edge but also have simple pieces too. Aside from having everyday sweaters and pants, they also sell dresses perfect for a birthday/holiday party or any formal affair. Shop Priceless. This is the boutique I have shopped the most on. Their prices are more reasonable and you get free shipping on orders of $50+ where the other sites can sometimes be over $100 for free shipping. They have the best sweaters that are both work and everyday appropriate and again are priced great! I’ve never been disappointed with anything I’ve bought from them. Hope’s. Hope’s is very trendy and boho chic with tons of lace and bright colors. They are a little on the pricey side too but their quality is great. They are the perfect shop to buy all your summer clothes because everything they have is so stylish and bright. I love going through their look book where they have their clothes already styled together in an outfit for you! In the world of dress boutiques prom season is in full swing! Yet some mothers and daughters think now is just the time to browse the racks and try on styles. Well, I am going to share a secret with you, SHOP EARLY. You may think that February is way too early to even think about buying a prom gown, but in reality you are right on track. The best advise I can give any girl who is looking for their prom dress is that shopping early really does pay off in the end. Here are 5 reasons why shopping early is the best way to go. Happy prom shopping, xoxo. Ordering Process. One thing prom shoppers need to remember is how long the ordering process does take. A standard special order can take anywhere from 4-12 weeks to arrive. Some dresses are in stock in our warehouse and are able to be shipped ASAP but others need to be made from scratch and sent through international shipping which could take up to 12 weeks. Shopping months before prom ensures your dress will arrive with time to spare! Waiting until the last minute could result in you having to buy a dress off the floor that may be too big and would need to have it sized down to fit properly (aka more cost in alterations). Alterations. On top of waiting 4-12 weeks for your special order to arrive, you also need to think about having alterations done. Alterations can take an additional 2-4 weeks depending on how many dresses are in line to be altered. The last thing you want to do is pick up your dress the week of your prom because you waited to long to purchase a gown. Buying early means having your alterations done way before prom. Event Tracking. 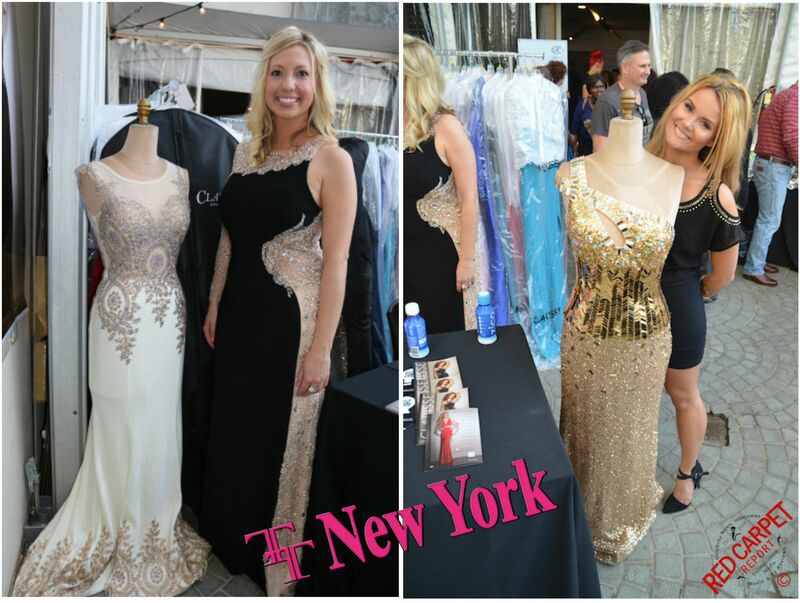 TT New York does prom tracking, which means we do not double sell a dress to a school. Basically you won’t have to worry about a “who wore it better” on your prom night! If you wait until April or May to find your dress for your prom in June, there will be a bunch of dresses that were already purchased from your school that you can’t even try on. Who wants to fall in love with a dress and then be told they can’t buy it? That is why if you shop early, you get the first pick! Less stress! Nothing is more stressful than being weeks away from prom and not having a gown. On top of getting the tuxedo matched, renting a limo, finding a place to get pictures taken, and so on, you don’t need the added stress of finding a gown. Purchasing a dress you love months in advance allows you to focus on all the other aspects of prom that need planning! You get first pick on all the new styles! Throughout prom season, styles will get discontinued or become back ordered and you won’t have to worry about that if you shop early. 1. You get first pick on all the brand new arrivals. 2. You are ensured that you can still get your dream dress in. Clarisse at the Grammy’s Gift Suite! I have exciting news to announce! 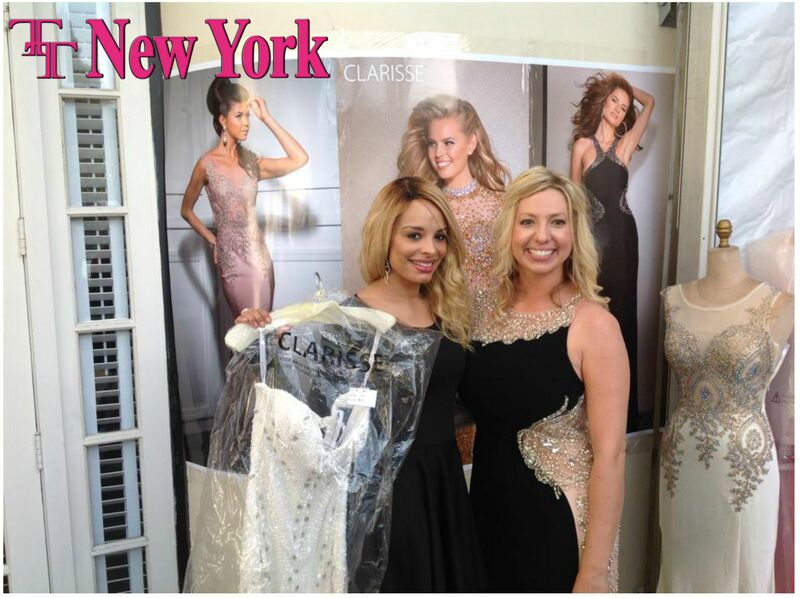 Our newest dress line, Clarisse, was at the 2015 Grammy Gift Suite Sunday night! TT New York is the exclusive retailer for Clarisse in the WNY area, and the styles featured are available at our Boulevard Mall location! 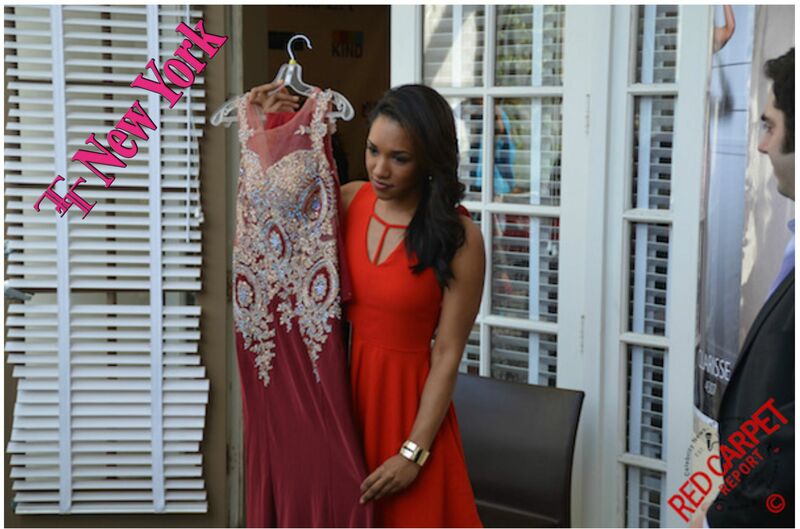 Stop in and snag a red carpet dress to rock at your high school prom or next formal event! Happy shopping, xoxo. Cleanse– I know its a hassle, but washing your face twice a day is crucial! Cleaning your skin before bed cleans your pores which prevents any blockage, aka stops pimples from forming. Wash your face once before bed and then once in the morning to keep it healthy and pimple free. Just don’t over clean your face because then you will make your face oily and that’s not what you want! Toner– This is the second step to any skin care regime and its really important. A toner can be applied with a cotton pad to get any left over makeup off your face after you cleanse. This step will also unclog pores and ensure breathable glowing skin! Moisturize– The more you moisturize the better your skin will look. Do this step twice a day, especially if you have dry skin. I found that the oil-free moisturizer works the best because it helps to keep my skin oil-free. Exfoliate– Do this once a week for smaller pores and to get all the dry skin off your face! Exfoliating your skin removes all dead skin cells that will ultimately clog your pores, if you remove it before that happens than you’re ahead of the pretty skin game! Do not do this everyday because it could quickly dry out your face or irritate your skin. Mask– You’ve probably done these at plenty of sleepovers with your friends. An exfoliating mask is excellent to use once a week to help keep your skin smooth and healthy. Eyes– The skin around the eyes is the most sensitive skin on your entire face. To ensure that you keep your eyes looking wrinkle free, use eye cream nightly. Also your eye shadow will go on and stay on just from using the eye cream! You’ll look younger longer with this little trick! Water– Drink a lot of water daily. Water is a remedy for many of the body’s imperfections, but for the skin its vital. Drinking at least 8 large glasses a day can improve your skin and clear up acne. If you’re like me and sometimes forget to remember to drink water, bring a large plastic water bottle around with you and fill it up twice a day. It’s easier to keep track of how many times you fill up a 34 oz water bottle than how many glasses of water you’ve had throughout the day. Sunscreen– Sun damage skin cells so don’t let you skin go unprotected. Even in the winter months! Kill two birds with one stone and get moisturizer that also has SPF in it, you will keep your face protected and smooth without having to apply sunscreen daily.